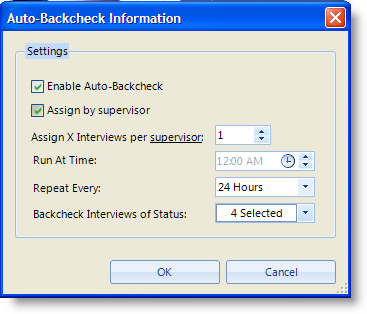 Save the survey and verify that the interviewers have synched the survey to the latest version. Important Note: The flagging will start happening as soon as the survey is synched to the devices. Devices that have not synched to the version where you have activated the flagging in will not flag the interviews so make sure the interviewers are re-synching after you make this change. Then continue with the export process as usual. The new exported fields will be included in the output data file. The use of “Fixed File” formats such as SPSS Quantum and Triple-S for tracker study is highly not recommended due to the inherent limitations within these files and the data processing requirements of such projects. Dooblo recommends using export formats such as SPSS or IBM SPSS Data Collection (formerly Dimensions) with tracker studies. In case using filed-file formats is critical for the project, please consult the above best practices and the Dooblo support team to ensure smooth execution of the project. You can access your organization data using the SurveyToGo REST API. The REST API allows you to create a tight integration between the SurveyToGo system and any 3rd party system. Using the API requires prior knowledge of the REST protocol and experience in programming. You can use the REST API from any operating system and any programming language. The SurveyToGo REST API consists of a set of operations which are listed below. Please note we are adding to the list of operations so check back often or subscribe to this topic to stay on top of any new REST operation that is supported. SurveyInterviewData – returns the actual XML data of the interviews based on ID’s. Calling the actual operations involves referencing the correct URL and passing the relevant user/password details. To call the various operations you need to specify a valid user ID. The user ID is in the form of XXXX-XXXX-XXXX/YYYY where the first part is your organization REST API Key and the second part is the relevant user name you wish to use for the operations. Please note the user accessing the REST API needs to have the relevant permissions for the operations that user is calling. For example, if the user does not belong to a certain project that user will get an authorization error if that user attempts to call operations for that project. Contact support@dooblo.com to receive your organization REST API Key to use with the REST API. In some calls you can request to receive the output of the data in either JSON or XML format. This is intended to cater to each programmer preference. However, please keep in mind that for some operations that return either interview data or survey data in them, only XML will be supported as an output format. If you try to call these with JSON as format you will receive an error: “Error: This method supports only xml” from the API. If you developed a cool integration using the SurveyToGo REST API, we would love to hear about it and possibly share the project highlights with the rest of our community along with your name and details (if you wish) to promote your expertise and broaden the horizon of our community! Let us know by emailing us at ofer@dooblo.com . Missing an API that will assist you in your integration? Let us know! If during the development of your integration you are missing an API please let us know at support@dooblo.com and we will make sure our SurveyToGo REST API product team is notified of the request to be reviewed for adding to future versions. The “daily uploads by surveyor” shows you the number of uploaded interviews per interviewer for any given day along with the totals. The “daily uploads by survey version” shows you the number of uploaded interviews for a given survey version for the time range. This report is very useful to make sure that once you deploy a new version of the survey you do not get any new interviews for the older version of that survey and thus confirm that all interviewers are running with the latest version of the survey. The “daily uploads by interview status” shows you the number of interviews in each of the different statuses for a given day in the time range. This report is very useful when you need to make sure that no “old interviews” have not yet been approved. The “GPS Usage by surveyor” shows you for each of the surveyors, how many interviews they completed vs the number of interviews completed with GPS information. This report is very useful to pin point which interviewer is not using the GPS feature on his/her device and get the interviewers to start using GPS. The “Attachments uploaded by surveyor” report shows you the number of interviews uploaded by the interviewer vs the number of attachments uploaded during that day for that interviewer. The data is also broken down by day. This report is useful to confirm that interviewers are collecting attachments for surveys. Then, you can start dragging the relevant fields to the reports pivot area. This is very similar to the Excel Pivot tables feature, so if you are familiar with that you should feel right at home with this pivot report.